Bronzed Bunny organic tanning spa at Monarch Bay Plaza shopping center in Dana Point, CA. Let us introduce you to a whole new experience... The Bronzed Bunny Experience. 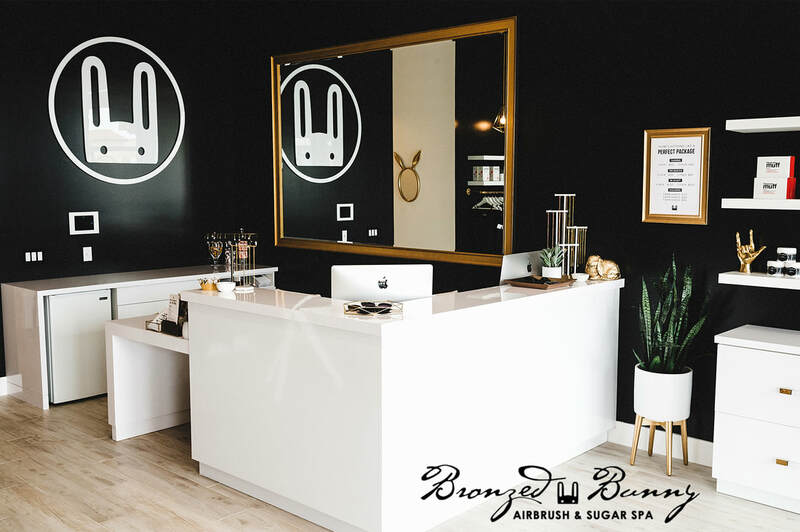 Bronzed Bunny is a chic, elegant, and Organic Tanning Spa where old Hollywood meets new. We offer clients a unique experience where they can sip Bellinis and frolic in our bunny lounge all while shopping trendy accessories and little black dresses! Our signature organic tanning solution is unlike any other on the market! Pair this with our custom airbrush technique we provide a flawless, sheer coverage that is odorless and won't leave clients sticky and orange, just BEAUTIFUL and BRONZED. We also offer an amazing Sugar Spa. Sugaring is an all-natural heat-free hair removal method that is quick and painless, an amazing alternative to outdated waxing. Our Sugar Spa also includes our signature Body Sculpting treatment called Sculptice, where we instantly transform your body with wood and ice... you won't want to miss that!